Detective Chief Inspector Alan Banks is as famous as his creator, Peter Robinson, a Yorkshire born writer, and the words ‘The New Inspector Banks Novel’ in a book store window triggers an avalanche of fans eager for a new mystery and a further instalment in the life of Robinson’s personable detective. 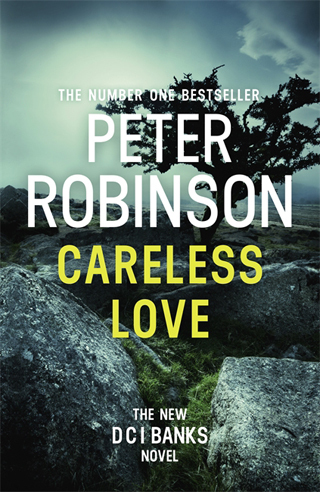 Careless Love, Robinson’s latest book, is a misnomer for a fast-paced and ingenious story covering the deaths of three people, one of whom is an obvious murder victim, but it takes almost the full length of the book to discover whether the others are the victims of suicide, accident or murder, and who is responsible. Two girls, students at the local college, are found dead, as is a wealthy middle aged man, all in the local area of the Dales, and the story throws up suspicions of prostitution, medical negligence and blackmail within the peaceful and affluent areas of the countryside. Robinson makes easy work of the conflicting and puzzling clues that emerge, and his text flows with an assurance and speed that make the complicated case extraordinarily easy to follow. The tranquility of the Dales, however, covers murders as brutal as in any big city, and the city of Leeds is a constant backdrop to Banks’ solving of the crimes, as he liaises with colleagues in the City police who we get to know throughout the series. Robinson’s own familiarity and affection for the area is constantly shown, as he comments on pubs and streets which are well-known to those who live and work in the city. DCI Alan Banks is an ordinary guy from a working class home in Peterborough. He joins the police and is eventually transferred, with his wife and growing family, to a station in the beautiful Yorkshire Dales, and the series of books follows Banks’ career and failing marriage and divorce, his new relationships and his humane tendencies and love of music, which are always intermingled with the intriguing crimes that he works on. Robinson has a unique knack of revealing to the layman the painstaking and ingenious ways in which the numerous experts who work for the police can wheedle out the most infinitesimal clues surrounding a suspicious death, which can set the detectives on the track of the truth behind the deaths. The success of this series of books is due to the intelligent and meticulous way that Robinson has painted the character of Banks, who is the embodiment of the true detective, but is the first to admit to his human flaws and uncertainties. He is tough, gentle, clever and angry in turn as he responds to both his professional and private life, and the reader is with him on his journey through the vicissitudes of life. Robinson draws him with a sure hand and an affection that is infectious. His characters are as real as you can get on paper, and a blissful few hours can be spent in their company. Peter Robinson is at the moment at the top of his tree. His prolific output and constant variety of plots and themes never fail to impress and intrigue, and he is riding high as a superb crime and thriller writer of distinction.